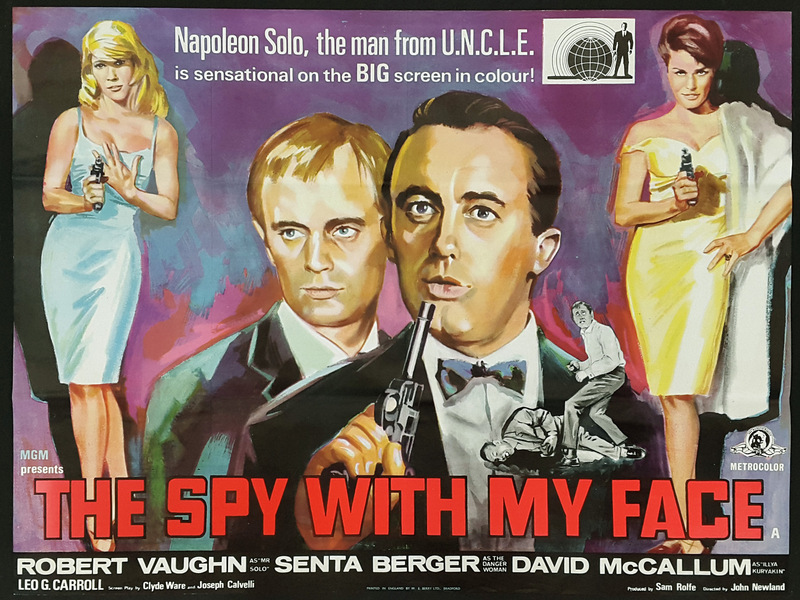 Poster for The Spy With My Face, the movie version of The Double Affair, featuring Robert Vaughn as Solo, Senta Berger as Serena and David McCallum (in that order). Based on the “colour” spelling, it’s probably from the U.K. release. May 1964 was the early days of production of The Man From U.N.C.L.E. The pilot had resulted in a sale to NBC. But the first regular episode woudn’t go into production until June 1 of that year. As a result, the first draft of The Double Affair, dated May 12, 1964, was written as the show was getting up to speed. The draft, written by Clyde Ware, is significantly different than the episode that would air on Nov. 17 1964. Among other things, the U.N.C.L.E. chief in this draft is Mr. Allison, the character played by Will Kuluva in the pilot. The part would be renamed Alexander Waverly and recast with Leo G. Carroll. Also, in this script, the villainous organization is referred to as MAGGOTT, spelled with all capital letters but no sign if it’s actually an acronym. When the pilot (The Vulcan Affair) was filmed, the organization was called Thrush. But there was a debate among Arena Productions (the production company that made U.N.C.L.E. ), Metro-Goldwyn-Mayer and NBC whether that was a good name. One alternative was “Wasp.” That was eventually rejected, although the movie version of The Vulcan Affair saw “Wasp” dubbed for “Thrush.” MAGGOTT also (thankfully) went by the wayside. Still, it makes for amusing reading when looking at this script. Eventually, Arena/MGM/NBC agreed on Thrush for the series. The story concerns an attempt by the villains to steal Project EarthSave. As described in this script it’s the “final weapon,” originally developed by scientists of multiple nations. The director of the underground facility in Switzerland that houses Project EarthSave provides U.N.C.L.E. agents some background in Act III. The choice was dictated by the possibility of attack by a hostile force…Oh, not of this planet — the use of Project EarthSave might very well destroy the earth itself! But our scientists have picked up strange fragments of radio waves — from beyond our galaxy! If the world should be attacked from beyond the stars — imagine the power such an attack force would possess! Project EarthSave might wellbe our last line of defense. Our only chance. To get at Project EarthSave, MAGGOTT has used plastic surgery to make one of its operatives the twin of U.N.C.L.E.’s Napoleon Solo. That’s because Solo iss part of a team of U.N.C.L.E. agents who every August deliver the new combination for the vault that contains Project EarthSave. For this run, Russian U.N.C.L.E. Illya Kuryakin is participating for the first time. The head of the MAGGOTT operation is Mars Two, who’d be renamed Darius Two in the episode. His team includes femme fatale Serena, who’d be played by Senta Berger. In the episode, Berger’s title care would appear after Robert Vaughn’s but before David McCallum’s. MAGGOTT eventually captures Solo and substitutes its man. From that point onward in the script, the double is referred to as “Solo” (with quotation marks around the name) to distinguish him from the real Solo. As you might surmise, MAGGOTT doesn’t succeed in getting Project EarthSave. However, there are still more differences in this script compared with the final episode, or, for that matter, The Spy With My Face,. The latter was the movie version of the episode, which included extra footage. It was released in the U.K. in August 1965. But U.N.C.L.E. was so popular, it got a U.S. release in 1966. In any case, here are some aspects of the script that would be changed in the final version. –A line by Mars Two, “And then UNCLE — and the rest of the world — will listen to MAGGOTT’s terms!” doesn’t make the episode. Imagine you’re an actor saying that line. –We’re told that Solo’s mother lived in Wisconsin but she died in 1956 of natural causes. This occurs early in the script when MAGGOTT is assessing whether Solo’s double needs any last minute work to perfect the masquerade. — One of the U.N.C.L.E. agents involved in the Project EarthSave mission is named Cluade Chanso. “Claude is tall, dark, suave — and as attractive as all Frenchmen would like the world to believe they are,” according to the stage directions. 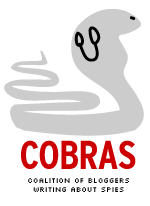 The character would become Arsene Coria, an Italian agent, in the finished episode. –The script includes Namana, an African agent who would be in the final episode. Namana is alive at the end of this script. In the episode, he’s killed by Solo’s double after the vault to Project EarthSave is open. Calvelli was associate produce for roughly the first half of U.N.C.L.E. first season. My guess he did the bulk of the revising from the May 1964 script.